This article is about the automobile executive. For other uses, see Edsel Ford (disambiguation). Edsel Bryant Ford (November 6, 1893 – May 26, 1943) was the son of Clara Jane Bryant Ford and the only child of Henry Ford. He was the president of Ford Motor Company from 1919 to his death in 1943. His eldest son was Henry Ford II. He worked closely with his father, as sole heir to the business, but was keen to develop cars more exciting than the Model T ("Tin Lizzie"), in line with his personal tastes. Even as president, he had trouble persuading his father to allow any departure from this formula. Only a change in market conditions enabled him to develop the more fashionable Model A in 1927. Edsel also founded the Mercury division and was responsible for the Lincoln Zephyr and Lincoln Continental. He introduced important features, such as hydraulic brakes, and greatly strengthened the company’s overseas production. Ford was a major art benefactor in Detroit and also financed Admiral Richard Byrd’s polar explorations. He died of stomach cancer aged 49, with his father resuming the presidency of the company, before handing it over to Henry Ford II. The range of cars launched by Ford in 1957 under the name Edsel is remembered as one of the classic marketing failures. 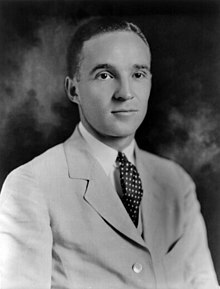 Edsel Ford was born in Detroit, Michigan, US, as the only child of Clara and Henry Ford, being named for Edsel Ruddiman, one of Henry Ford's closest childhood friends. He was groomed to take over the family automobile business, and grew up tinkering on cars with his father. He became secretary of Ford in 1915, and married Eleanor Lowthian Clay (1896–1976), the niece of department store owner J. L. Hudson, on November 1, 1916. Together, they had four children: Henry Ford II (1917–1987), Benson Ford (1919–1978), Josephine Clay Ford (1923–2005), and William Clay Ford (1925–2014). They made their home at 2171 Iroquois Street, in the Indian Village neighborhood of Detroit. Ford went to The Hotchkiss School, in Lakeville, Connecticut, and the Detroit University School. His family donated to both institutions. The school library at Hotchkiss is named the Edsel Ford Memorial Library. The younger Ford showed more interest than his father in flashier styling for automobiles. He indulged this proclivity in part with the purchase of the Lincoln Motor Company in 1922. His affinity for sports cars was demonstrated in his personal vehicles: Edsel bought the first MG motorcar imported to the US. 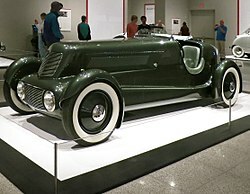 In 1932, he had an aluminum, boat-tailed speedster automobile custom designed by Ford's first designer, E. T. (Bob) Gregorie and featuring Ford's brand-new V8, the first low-cost, eight-cylinder engine. This car was sold at an auction during the Amelia Island Concours d'Elegance in 1976. After becoming the president of Ford, he long advocated the introduction of a more modern automobile to replace the Model T, but was repeatedly overruled by his father. Dwindling market share finally made introduction of a new model inevitable: the Model A. During the design of the Model A in 1927, Henry Ford assured mechanical quality and reliability, allowing his son to develop the body, with the help of designer József Galamb. Edsel also prevailed upon his father to allow the inclusion of four-wheel mechanical brakes and a sliding-gear transmission on this model. The resulting Model A was a commercial success, selling over four million during four years of production. As president, Edsel Ford often disagreed with his father on major decisions and was occasionally humiliated in public by the older man. The relationship between the father and son was always close, but always fraught with unhealthy aspects. Edsel managed to introduce many lasting changes. He founded and named the Mercury division. He was responsible for the Lincoln Zephyr and Continental. He significantly strengthened Ford Motors' overseas production, and modernized the company's cars, such as by introducing hydraulic brakes. The Ford Motor Company played a key role in the arming of the US "Arsenal of Democracy". With Edsel leading the company, he set the goal of producing one bomber per hour at Ford's expansive Willow Run manufacturing complex, where the B-24 was produced. It was said that the stress of this job caused Edsel to become mortally ill.
Edsel Ford developed metastatic stomach cancer and undulant fever. Surgery for the cancer was unsuccessful due to the metastasis. Ford died in 1943 at Gaukler Point, in his lakeside home in Grosse Pointe Shores, at the age of 49. His father resumed the presidency of the company. All of Edsel Ford's nonvoting stock was donated through a codicil in his will to the Ford Foundation, which he had founded with his father seven years earlier. He is buried at Woodlawn Cemetery in Detroit, Michigan. Each of Edsel Ford's children inherited sizable shares in the Ford Motor Company, and the three sons all worked in the family business. Henry Ford II succeeded his grandfather as president of Ford on September 21, 1945. Edsel Ford was one of the most significant art benefactors in Detroit history. As president of the Detroit Arts Commission, he commissioned the famous Diego Rivera Detroit Industry Murals in the Detroit Institute of Arts (DIA). He was an early collector of African art and his contributions became part of the core of the original DIA African art collection. After his death, his family continued to make significant contributions. He helped finance exploratory expeditions, including the historic flight of Admiral Richard Byrd over the North Pole in 1926. Byrd, in his Antarctic expeditions, also financed by Edsel, named the Edsel Ford Range of mountains after him. Other Antarctic homages include Ford Massif, Ford Nunataks, and Ford Peak. Two of the three high schools in Dearborn are named after Edsel Ford: Edsel Ford High School and Fordson High School; Fordson was the brand name of a line of tractors and was originally started as a separate company, Henry Ford & Son, later absorbed into the Ford Motor Company. Interstate 94 in the Detroit Metropolitan Area is named the Edsel Ford Freeway. In September 1957, Ford Motor Company unveiled a new division of cars called Edsel. The Edsel division included the Citation, Corsair, Pacer, Ranger, Bermuda, Villager, and Roundup models. The Edsel division is remembered as a significant commercial failure. The cars sold moderately well in their first year, but the Edsel division was discontinued soon after the 1960 models were introduced. In 1929, the Ford family moved into Gaukler Point, their new home designed by Albert Kahn in 1929, on the shores of Lake St. Clair in Grosse Pointe Shores, Michigan. The estate's gardens were designed by landscape architect Jens Jensen with his traditional long view, giving visitors a glimpse of the residence down the long meadow before revealing the entire house at drive's end. He also designed the gardens for Edsel and Eleanor's summer estate Skylands in Seal Harbor on Mount Desert Island in Maine. Jensen designed work for their two other Michigan residences, one being Haven Hill, between 1922 and 1935. Haven Hill, now within the Highland Recreation Area near White Lake Township in southeastern Michigan, is designated as both a Michigan State Historical Landmark and State Natural Preserve. Jensen's landscape elements, with the diversity of tree, plant, and animal life, combine aesthetics, history, and nature. Edsel Ford died at Gaukler Point in 1943. His wife Eleanor continued living there until her death in 1976. It was her wish that the property be used for "the benefit of the public." The Edsel and Eleanor Ford House is now open to the public. Located on 87 acres (35.2 ha), the house has an excellent collection of the Fords' original antiques and art, and the historical landscape grounds on the lakefront. The museum currently hosts tours, classes, lectures, and special events. The property is listed on the National Register of Historic Places. ^ a b "Henry Ford". Ford Motor Co. Archived from the original on April 5, 2007. Retrieved 2007-02-14. The years between the world wars were a period of hectic expansion. In 1917, Ford Motor Company began producing trucks and tractors. In 1919, a conflict with stockholders over the millions to be spent building the giant Rouge manufacturing complex in Dearborn, Michigan, led to the company becoming wholly owned by Henry Ford and his son, Edsel, who then succeeded his father as president. After Edsel Ford died in 1943, a saddened Henry Ford resumed the presidency. Henry Ford resigned for the second time at the end of World War II. His eldest grandson, Henry Ford II, became president on Sept. 21, 1945. Even as Henry Ford II drove the industry's first postwar car off the assembly line, he was making plans to reorganize and decentralize the company to resume its prewar position as a major force in a fiercely competitive auto industry. Henry Ford II provided strong leadership for Ford Motor Company from the postwar era into the 1980s. He was president from 1945 until 1960 and chief executive officer from 1945 until 1979. He was chairman of the board of directors from 1960 until 1980, and remained as chairman of the finance committee from 1980 until his death in 1987. ^ "Henry Ford Estate: The Ford Family". HenryFordEstate.org. Retrieved 2007-04-11. ^ "Henry Ford's Only Son Marries". The New York Times. 1916-11-02. (Subscription required (help)). ^ "Josephine Clay Ford, 81, a Philanthropist, Dies". The New York Times. Associated Press. 2005-06-03. Josephine Clay Ford, a philanthropist who was the sole granddaughter of the automotive pioneer Henry Ford, died on Wednesday. She was 81 and lived in suburban Grosse Pointe Farms. Her death was announced in an e-mail message to Ford Motor Company employees by the company chairman, Bill Ford Jr., a nephew. The message did not give a place or cause of death. Mrs. Ford, known as Dody, established a foundation with her husband that donated millions of dollars. Mrs. Ford was born in 1923, the third of Edsel and Eleanor Ford's four children. Edsel was Henry Ford's only son. Grosse Pointe Farms. ^ "Josephine C. Ford is Wed in Michigan; Granddaughter of Founder of Motor Company Is Married to Walter B. Ford 2d, U.S.N.R." The New York Times. 1943-01-03. (Subscription required (help)). ^ 1930 United States Census for Detroit, Michigan. ^ Gross, Ken. "1932 Ford Model 18 Edsel Ford Speedster". RM Sotheby's. Retrieved 4 March 2018. ^ "Edsel Bryant Ford". edsel.com. ^ Sorensen, Charles E.; with Williamson, Samuel T. (1956), My Forty Years with Ford, New York, New York, USA: Norton, LCCN 56010854 . Various republications, including ISBN 9780814332795., pp. 301–333. ^ Warren, Tamara (2014-07-19). "Willow Run, Edsel Ford and Detroit's role in arming the U.S. in WW II". Detroit Free Press. ^ "CORPORATIONS: Death & Taxes". Time. 41. 1943-06-07. (Subscription required (help)). ^ "Edsel Ford Dies in Detroit at 49. Motor Company President, the Only Son of Its Founder, Had Long Been Ill". The New York Times. Associated Press. 1943-05-26. Edsel Ford, 49-year-old president of the Ford Motor Company, died this morning at his home at Grosse Pointe Shores following an illness of six weeks. ^ Lewis, David L. (1976). The Public Image Of Henry Ford. ISBN 978-0-8143-1892-8. Retrieved 2010-10-09. ^ "Edsel Agonistes". Time. 2007-09-07. Retrieved 2007-08-21. Edsel was a first name before it was ever a car name. But it was never a very popular thing to call a child: according to the Social Security Administration—which has time for this sort of thing—the name Edsel has ranked only as high as 400th on the top 1,000 names for boys, and that was in 1927. More popular names that year included the soaring Kermit, Buford and Elvin. ^ "Henry Ford & Family". Ford Motor Company. Archived from the original on 2007-02-13. Retrieved 2007-04-11. ^ "American Art". Detroit Institute of Arts. Archived from the original on 2016-01-25. Retrieved 2016-01-08. ^ a b c Grese, Robert E. (1992). Jens Jensen, Maker of Natural Parks and Gardens. The Johns Hopkins University Press. pp. 102, 160, 184. ISBN 978-0801842870. (Subscription required (help)). ^ "From My Home to Yours". Martha Stewart Living. June 2007. Retrieved 2009-06-16. ^ "Pictures". The Haven Hill Project. ^ "Highland Recreation Area Welcome". The Haven Hill Project. ^ "The Ford Family". Edsel & Eleanor Ford House. ^ "Edsel and Eleanor Ford House". National Park Service. Retrieved 2008-06-11. Producers: A&E with Richard Guy Wilson, Ph.D. (2005). "The Auto Baron Estates". America's Castles. A&E. Bak, Richard (2003-09-12). Henry and Edsel: The Creation of the Ford Empire. Wiley. ISBN 978-0471234876. Baime, A.J. (2014-06-03). The Arsenal of Democracy: FDR, Detroit, and an Epic Quest to Arm an America at War. Houghton Mifflin. ISBN 978-0547719283. This page is based on the Wikipedia article Edsel Ford; it is used under the Creative Commons Attribution-ShareAlike 3.0 Unported License (CC-BY-SA). You may redistribute it, verbatim or modified, providing that you comply with the terms of the CC-BY-SA.